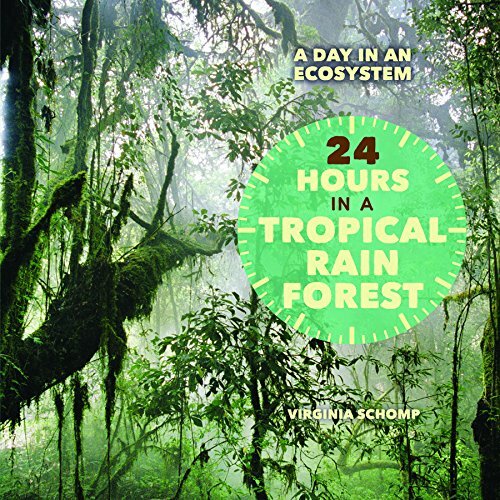 "Take a look at what takes place within a 24-hour period in a tropical rain forest. Learn firsthand about the features, plant life, and animals of the habitat"--Provided by publisher. Gr 4-6-Schomp introduces ecosystems by focusing on one day in a specific locale. Whether describing the Great Barrier Reef, Florida Everglades, or Sahara Desert, the easy texts reveal how plants, animals, and people adapt to challenges. For example, Tundra examines the unique environment created by a short growing season. The conversational style incorporates specialized terms such as &quot;ergs&quot; and &quot;wadi&quot; that reappear in the glossary. Stock photos and additional topics explained in sidebars relate to the main texts. Diagrams would have helped visualize concepts such as rain-forest layers. In most of the volumes, a world map identifies locations of major examples of the ecosystem and emphasizes the one featured. A final &quot;Fast Facts&quot; page discusses representative plants and animals, temperature, population, and other statistics. Although each volume stands alone, concepts such as adaptation, camouflage, predators, and environmental threats that appear in each one could support small group activities to analyze one ecosystem and compare results with others.&#x3b1;(c) Copyright 2013. Library Journal. LLC, a wholly owned subsidiary of Media Source, Inc. No redistribution permitted.